We all need to clean our clothes. As technology increasingly makes its way into every aspect of our lives, getting the task done becomes both easier and more complicated. Gone are the days of manual settings, timing laundry loads in our heads, estimating when the dryer is done. Smart Washers and Dryers are on the scene, here to solve all of our problems. But, what is a Smart Washer and Dryer, and how do they really help us get our laundry done better? We have assembled the answers to some of the most frequently asked questions about the topic in order to help you understand why you need, or even want, Smart technology in a laundry appliance. Additionally, we have spent a lot of time and effort researching the best of the Smart Washer and Dryer lineup. Our reviewers have tested and tried various features on the machines, we have compared features and functions against each other, and we have researched what other reviewers have had to say. Through our extensive information gathering process, we have come up with the Top 7 Smart Washer and Dryer sets available, making the decision on which one is right for you... well, smart. 1. WHAT IS SMART TECHNOLOGY? Smart devices, most simply, are devices that are capable of sharing and interacting on a network. Smart technology is being integrated into all kinds of devices, from the most common items like your cell phone to more esoteric items like refrigerators and thermostats. The basic thread that binds smart devices together is that they all play along with each other remotely, and are able to be controlled remotely. For most smart devices, a smartphone or tablet becomes the controller. Some smart devices have onboard screens as well. 2. WHAT FEATURES ARE OFFERED BY SMART WASHERS AND DRYERS? If smart devices are remote, then can smart washers do your laundry from a distance? Well, sort of. Smart Washers and Dryers are able to hook up to your home's WiFi and can be controlled via smartphone apps. Some are also Nest compatible. What this connectivity amounts to is that when you aren't home, you can tell your washer and dryer to do things. Let's say you put a load of laundry in, and then have to leave the house for two hours. With a Smart Washer, you will be notified when your laundry is done via your smartphone. From there, you have the ability to set the washer or dryer to tumble clothes, rinse clothes, steam clothes, etc. until you get home and can take care of them. With no smart device, you run the risk of coming back to a musty or wrinkled pile of laundry that may need to be redone. For Nest compatible machines, you won't even have to do as much as tell your phone to control the machine. Nest already knows when no one is home, so it will automatically tell the washer and dryer to behave in the desired manner until someone is home. Additionally, Smart Washers and Dryers offer energy saving benefits and cycle programmability. 3. IS SMART TECHNOLOGY WORTH IT IN A WASHER AND DRYER? Depending on how often you are doing laundry while leaving the house, Smart Technology is of dubious necessity. Initially, Smart Washers and Dryers were far more expensive than their "dumb" counterparts, so the pick up was slow from consumers. At this point though, machines have become comparable in cost with regular washers and dryers, so why not have the added benefits of Smart Technology in your appliance? The added features certainly can help streamline your laundry process, keep you on task while you do other work around the house, offer high levels of cycle customizability and help keep your energy and water usage down! 4. WHERE CAN YOU BUY SMART WASHERS AND DRYERS? Smart Washers and Dryers have become readily available at most appliance stores. BestBuy, Percy's, Home Depot, Lowe's and Amazon all offer a few models to choose from. As with any appliance, it is a good idea to price shop around once you have settled on a model. 5. ARE SMART WASHERS AND DRYERS COMPATIBLE WITH OTHER SMART TECHNOLOGY? Smart Washers and Dryers are compatible with Android and iOS devices. Some are also compatible with Nest, Amazon Echo and Google Home. The general idea behind Smart Appliances is that you can control them when you are not at home, so most companies simply offer a free App for cell phone or tablet interface. We reviewed Smart Washers and Dryers based on Features, Pros and Cons, Price, Where to Buy, and Warranty. Our process includes product research, product use, researching other reviews and comparing numerous products against each other. While it would be impossible for us to use every washing machine out there, we spent considerable time and effort to get the right information about ease of use, dependability, and product features. Without further ado, our favorite picks from the Smart Washer and Dryer options are the following seven products. Washers and Dryers cost anywhere from $500 to $1500 per unit, depending on the make, model, and a number of extra features. Dimensions Width: 26 3/4 Inch Depth: 30 7/8 Inch Height: 75 7/8 Inch Washer Capacity: 3.8 Cu. Ft. Dryer Capacity: 5.9 Cu. Ft.
Key Features of this product include 11 washer temperature settings, customizable soak settings, spin settings, and 4 dryer settings. The main feature of this washer/dryer is that the unit is a space-saving combo. The washer unit is on the bottom, with the dryer unit above. 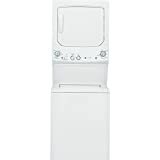 The GE Top Loading Washer/Dryer measures a tiny 26 3/4" x 30 7/8" x 75 7/8" while still offering a reasonable 3.8 cubit foot load capacity. This machine uses GE's proprietary ConnectPlus adapter in order to enable it with smart settings. You will be able to set applets on IFTTT, control the machine through either Google Assistant or Amazon Alexa voice commands. This product can be found on Amazon for around $1000.00 to $1200.00. GE offers a standard one year warranty on all its washers and dryers. During the first year of ownership, should any part fail due to defect it will be repaired or replaced free of charge for all labor and parts related to the defect. Additionally, GE covers the electronics of this line for 5 years. AddWash-Conveniently add in forgotten laundry after the cycle has begun with the AddWash door. PowerFoam-Optimizes your HE detergent performance to penetrate and cleanse fabric more deeply. The Samsung High-Efficiency Front loaders are largely the forerunners in the Smart Washer and Dryer game. They offer many well-rounded features and a superior clean. With 4.5 cubic feet of washing capacity, load size is a non-issue. Need to add that last piece of clothing, but the washer is already running? No problem, the Addwash door allows you to drop a piece into the front loader without having to interrupt the cycle. The washing machine boasts 14 cycles, with 5 spin settings and 5 temperature settings and can complete a full load in just over half an hour. Users can mix and match settings from their smartphone to create truly unique wash settings. The dryer can handle 7.5 cubic feet of laundry, which means that there is more space for a 4.5 cubic foot load to tumble, resulting in a faster dry. The dryer has 10 cycles and is equipped with sensors that automatically stop the machine when laundry is dry. Both the washer and dryer are equipped with quiet motors, maintenance sensors and energy saving features as well as steam settings, for extra sanitation and wrinkle-free clothing. The washer can be purchased for around $1000 or more, the dryer comes in at about $1400 and is available as either electric or gas. Samsung offers a 1-year warranty on their products, however, most poor reviews came from users who had a lot of trouble getting the warranty honored. Users report apathetic service personnel, high-cost repairs, and a lot of hoops to jump. In addition, there are extended warranties that break down to 2-year coverage on control boards, 3 years on tubs and drums, and 5 years on motors. Samsung products are available through the Samsung website, most appliance stores, and Amazon. The Bosch 800 series offers a lot of features. From customizable stain removal settings to automatic water sensors, Bosch covers every conceivable event. Proprietary AquaStop detects leaks and stops the machine before any damage can occur to the home. ActiveWater monitors and throttles water use for efficient washing. There are 14 wash settings, including steam sanitizing cycles and a Quick setting for smaller loads, again saving water. There are 10 options that offer you countless permutations for custom load settings. The machine automatically senses how large a laundry load is and uses the appropriate water and energy. All those things are standard on Bosch washers and dryers, add Smart Technology and you get a crazy high tech appliance. You can control this set remotely from your phone, monitor it, voice activate it, whatever. To top it off, these units are stackable! One downside, however, is that load capacity is a little small, with the washer handling 2.2 cubic feet and the dryer tackling 4 cubic feet. Another thing we noticed through use is that the machines always run longer than the digital readout indicates. This product can be found on Amazon for around $2700.00 as a set. Units can also be purchased individually for a range of $900.00- $1300.00 each, allowing you to choose trim level. The 800 series offers a few models with varying features. We reviewed the highest trim level. Bosch offers warranties for purchase. A one-year warranty is a $50 additional fee, with plans going up from there. Coverage is extensive, but not free. 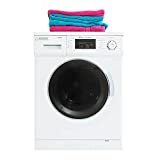 Key Features of this product include a large 4.5 cubic foot load capacity on the washer and 7.4 cubic feet of the dryer, vibration reduction technology to keep the shaking to a minimum, and reversible doors. The washer and dryer are both equipped with TrueSteam technology to keep musty odors and wrinkles out of your clothes. LG has a proprietary smart app that works with Android and iOS as well as near-field communication for direct pairing with some devices. The dryer features an automatic stop when clothes are dry and the washer offers 12 cycles for custom washing. Some users have reported that clothing gets snagged on the drums in these machines, causing damage to garments. Also, some users have noted that the sensors are inaccurate, resulting in damp loads from a "finished" dry cycle. The washing machine is available for about $1200, and the dryer can be purchased for around $1000.00. LG offers a 1-year warranty on parts and labor, and a 10 year extended warranty on motors. The drum is guaranteed for the life of the machine. 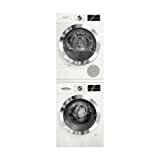 LG Washers and Dryers are available on Amazon, most appliance stores, Home Depot, Lowe's and the LG website. The Kenmore Elite Front Loading Washer and Dryer offer mammoth load capacity. The washing machine can handle 5.2 cubic feet of clothing. The dryer takes on 9.0 cubic feet, allowing plenty of breathing room for freshly washed loads. The washer offers 9 cycles and has an internal heating unit that assists stain removal and sanitization. The washer is also equipped with a steam cycle, offering odor and germ reduction. as well as ColdClean, which optimizes cold water cleaning. The dryer has six cycles, including a steam cycle for wrinkle reduction. The Kenmore Smart app is available for iOS, Android and Amazon Alexa/ It allows you to schedule loads, alerts you about load status and maintenance items, and offers a laundry list of cycle options from your smartphone. This product can be found on Amazon for around $1300 for the washing machine. The washer and dryer can be bundled as a set from Sears for about $1800.00. Kenmore offers a standard one-year warranty on defects, covering parts and labor for that time. There is also a lifetime warranty on motor defects. Kenmore is a staple name in appliances and is available at most appliance centers, Home Depot, Lowe's, Sears and amazon. One machine to rule them all! This is the only machine we have seen that is both a washer and a dryer. The Equator all in one is the ultimate in set-it-and-forget-it cleaning. Put a load in, come back to clean, dry clothing. 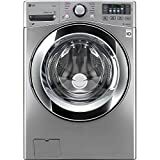 The machine can handle loads of 13 pounds and boasts automatic water level sensors, wrinkle guard and 14 wash/dry programs. This machine is also the ultimate in space saving. It does not require venting to dry and it on wheels for storage anywhere. While the Equator All-in-one offers fewer bells and whistles, it is the perfect machine for tiny apartment living with a price tag that can't be beaten. The only downside is that these machines require very clean water to function, so people with well water might be at a loss here. Equator warranties their combo machines for one year in residential settings. 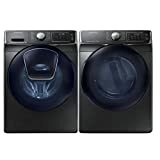 This washer and dryer bundle is similar to the large capacity Kenmore front loaders already mentioned, however, here we trade load capacity for a slew of features. The load capacity is still nothing to sneeze at, with a wash capacity of 4.5 cubic feet and a dry capacity of 7.4 cubic feet. Added to that, the bundle offers 21 pre-programmed cycles and 16 custom cycles. The washer uses Smart Motion technology, which uses six different wash movements to agitate clothing. Again, Kenmore offers the Steam Treat option for wrinkle block and odor reduction as well as ColdClean to optimize cold water washes. The Kenmore set features Accela wash, delivering clean loads in just 29 minutes. The Kenmore app is available for iOS, Android and Amazon Alexa. Users can purchase this bundle at Amazon and most appliance retailers. Given all of the options in the Smart Washer/Dryer category, the Smart features are the least of our concerns. Pretty much all the Smart Features are the same, across the board. All the machines we reviewed offer connectivity with smartphones and tablets, most of them are voice controllable, and we didn't explicitly see any listed as Nest compatible. That means that comparing smart washers and dryers is really about comparing the washing and drying functionality of each machine. For us, we felt that the most well-rounded machines were the Kenmore models. Both Kenmore models we reviewed offer good load capacity, smart water usage features, plenty of cycle customizability, comparable cost with other high-end models, and similar cycle options. The Kenmore models offer the best warranty, with a lifetime warranty on motor defects, with the fewest complaints about customer service. Ultimately, the Samsung machines and LG machines didn't offer anything over the Kenmore but did receive seriously bad marks when it came down to customer care. In a market where the options are all basically comparable, customer service is the deciding factor for us.